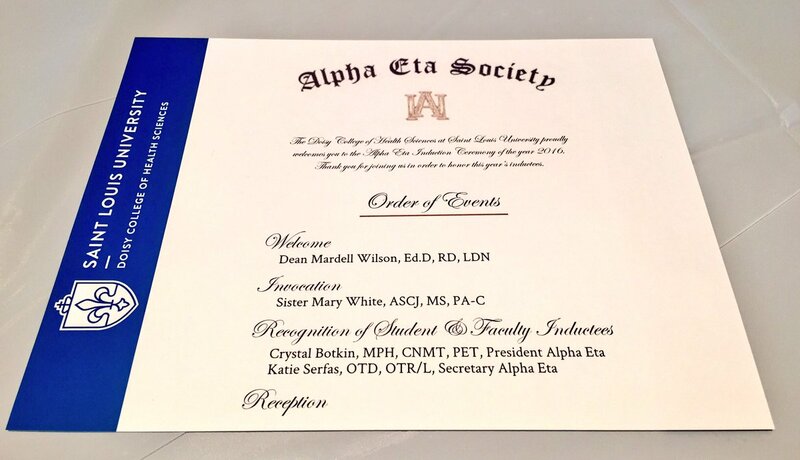 The Saint Louis University chapter of Alpha Eta, the National Scholastic Honor Society for Allied Health Professions, held its annual induction ceremony in the Multipurpose Room of the Allied Health Building at Saint Louis University on November 2, 2016. The Society is named for the Greek letters equivalent to the first letters of Allied Health (AH), which are Alpha Eta. The purpose of the Society is the promotion and recognition of significant scholarship, leadership, and contributions to the allied health professions. Congratulations on this prestigious and well-deserved honor!